The Subban rumours are rumblings at the moment, but they will grow as we approach the day PK's no trade clause kicks in on July 1st. The Maple Leafs and Oilers have been linked to Subban in rumours and speculation, although many other teams are likely to surface. 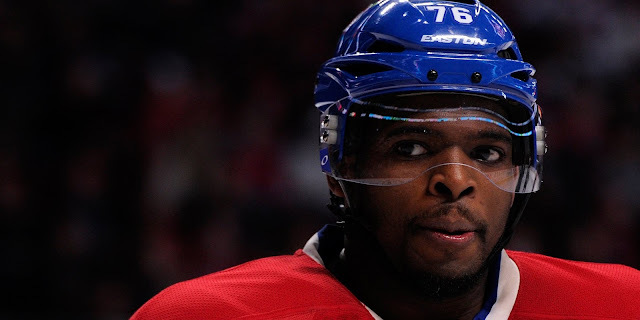 Have the Habs talked to other teams about Subban? Probably not. But there is enough evidence out there to suggest the front office has had internal discussions on the possibility. Many other Habs players find their names in trade talks, including Max Pacioretty, Alexei Emelin, Lars Eller, Alex Galchenyuk and David Desharnais. At the moment, the Emelin and Desharnais rumours seem to have the most legs. Everyone is waiting to see what happens with KHL forward Alex Radulov. Radulov has made his intent to return to the NHL clear, and the Avalanche and Leafs have been linked to the former Nashville Predator. You may have noticed I haven't posted as much lately. This is mainly because the rumour mill dies off quite a bit after the NHL trade deadline. Things will start to pick up as we get closer to the offseason, so don't you worry, the rumour blogs are coming! Within the next week or so I will upload a free agency rumour board to get you prepared for the July 1st free agent frenzy. But for now, back to the TV to watch some playoff hockey.